Once upon a time, not all that long ago, Motorola released an excellent flagship phone called the Moto X. Sure, it didn’t have the best battery ever and the camera was pretty lousy, but it just oozed charm and didn’t leave me wanting for much. Then, just months later, Motorola (with a perhaps little coaxing from Verizon) released a phone that addressed just about all of the X’s shortcomings. 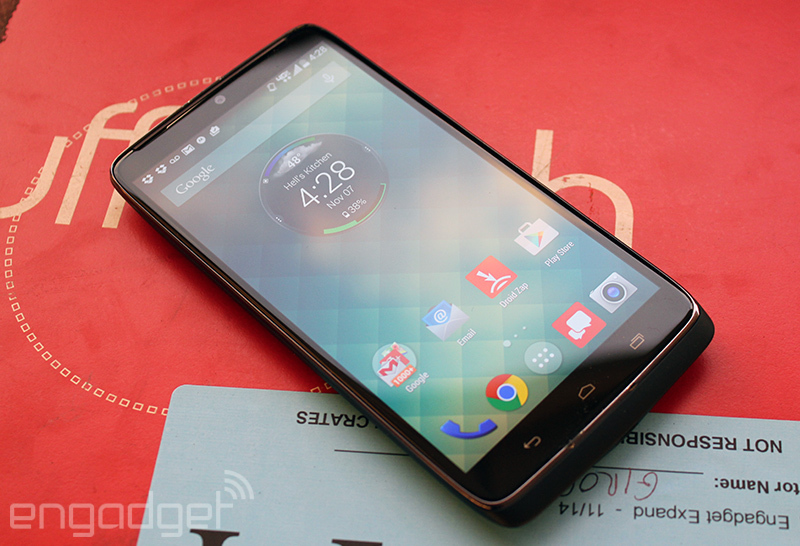 That, in a nutshell, is the story of the Droid Turbo: Just think of it as the Moto X Plus. But is it really that much better than that other phone we fell for? 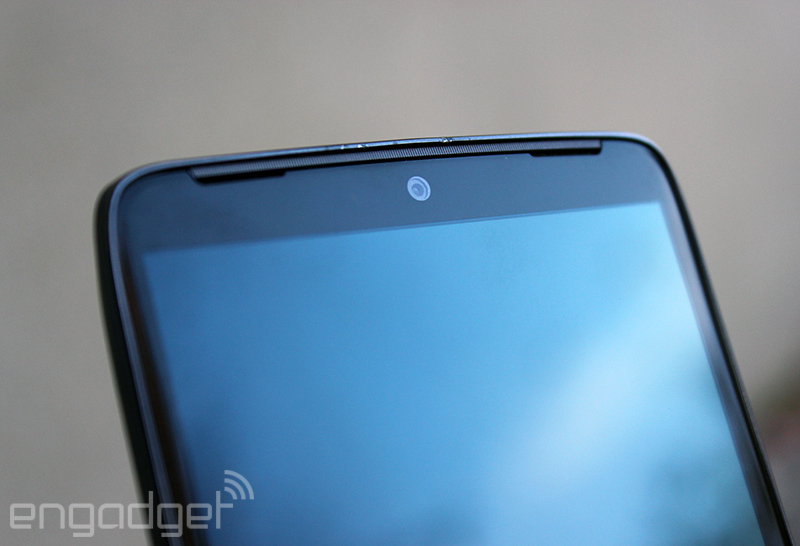 And will Verizon Moto X owners rue the day they extended their contracts? SUMMARYWhile it lacks the style and charm of the 2014 Moto X, the Droid Turbo is a powerhouse that manages to outperform its relative in nearly every way that matters. Sadly, it’s a Verizon exclusive so the rest of you (unless you live in Brazil and Mexico and buy a Moto Maxx) need not apply. When it came time to pick up my review unit, I was left with a terrible choice: I could go for the more traditional black/red Kevlar-weave models, or the comparatively exotic ballistic nylon. You can guess which path I took. Back in the day (by which I mean three years ago), Motorola used to have a notable flat-and-thin fixation. If you needed any proof that those days are over, just a take peek at the Turbo’s considerable heft and generous curves. This isn’t one of those anorexic phones that some companies keep churning out, and that’s a welcome change; after all, the Turbo’s more ample dimensions are put to good use here. For one, they make the handset feel reassuring to hold, with that prominent curve helping the Turbo nestle into your palm. And the second, arguably more important reason? To accommodate those precious innards, which include a speedy quad-core 2.7GHz Snapdragon 805 chip, 3GB of RAM and that tremendous 3,900mAh battery (Motorola says it’ll net you around 48 hours of continuous use on a charge, but we’ll revisit that claim later on). 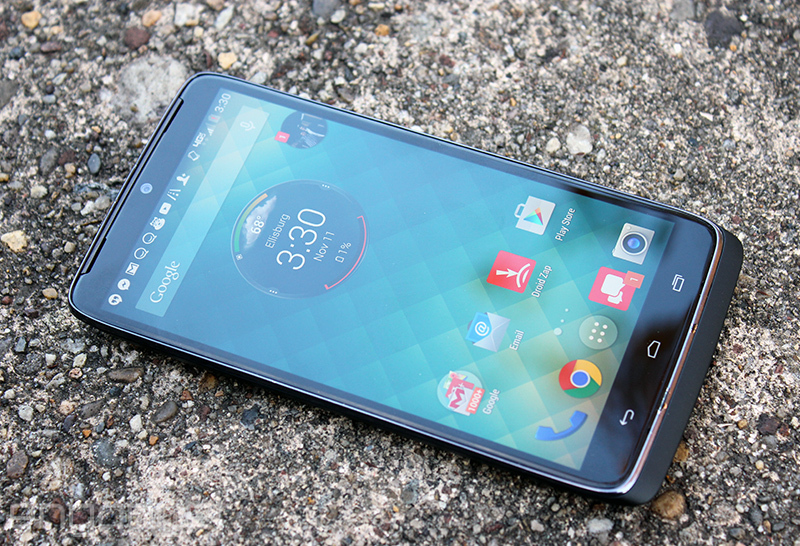 Anyway, yes, the Droid Turbo feels great, except for maybe the gummy-feeling volume rocker/SIM tray combo. Too bad it doesn’t look nearly as good. Between that wide swath of ballistic nylon and the teensy raised Droid logo on the phone’s bum, the Turbo looks like miniature luggage from behind — a Stuart Little-sized suitcase, if you will. The front is somehow even less visually interesting, though that changes when the 5.2-inch Quad HD screen comes alive. Other than that, though, there isn’t much to look at: just a wide speaker grille sitting above the 2-megapixel front-facing camera, and the capacitive touch buttons baked into the bezel beneath the screen. Android purists might wail in favor of on-screen buttons, but they’re plenty responsive and light up evenly when the going gets dim. The only other bit of flair is a slim band of shiny plastic that runs around the screen, though it has a nasty tendency to chip without much provocation. I’ll be the first to admit my bag has plenty in common with a junkyard, but even storing it a few times in one of the emptier pockets was enough to mar the finish. Sure, this might not sound like a huge deal, but it’s mighty obnoxious when the rest of the phone feels like it’s meant to take a licking. The Moto X and the Droid Turbo both sport 5.2-inch AMOLED screens, but that’s where the similarities end (much to the chagrin of X owners, I’d wager). That’s because the panel Motorola used on the Turbo runs at Quad HD (or 2,560 x 1,440, if you haven’t already committed it to memory), making it one of the most pixel-dense displays you’ll find on a smartphone. The effect, as you’d imagine, is pretty stunning. Your stories, your videos, your apps; they’re going to look just lovely. That said, a screen like this will make you all too aware that the internet is peppered with low-res images and icons, so be ready to shield your eyes whenever you come across them. Skype is a good example of this visual discrepancy in action: Your messages will look crisp, while emoticons will be tiny since they’re so low-res. At some point, though, you’ve got to wonder when (or even if) enough will be enough. Do all those extra pixels crammed into each linear inch really make a difference? We’re getting to the point where the inability to distinguish one pixel from another is just a given, so all the other factors suddenly become more important. The Turbo’s Super AMOLED panel, for instance, can oscillate between bright, punchy colors and sumptuous blacks. The downside is that images and video take on a slightly warm cast (Sutton Foster look distinctly tanned in one of my test videos), which won’t be everyone’s cup of tea. Viewing angles are solid too, if not the best I’ve come across, and even at maximum brightness, the Turbo’s screen still doesn’t light up the night with quite the same vigor as the Moto X.
Ah, but here’s the rub! That screen might lend itself well to your video collection, but the single-speaker setup isn’t going to thrill you. Frankly, this part’s a little frustrating — even the budget-priced Moto G has a pair of front-facing speakers, while the clearly higher-end Turbo has to make do with one less driver. The end result is audio that’s plenty loud, but cramped and muddy, without much distinction between channels. That’s not to say the speaker’s bad, per se; it’s on par with most of the speakers in other smartphones, which is to say they get the job done and don’t aspire to much more. Keep a pair of headphones handy and you’ll never have to worry about it. If you’ve handled a Motorola phone in the past year, you’ve probably noticed that the company doesn’t like futzing around with pure Android when it doesn’t have to. Thankfully, that philosophy hasn’t changed, so we’re treated to almost the same, nearly stock version of Android 4.4.4 that graced the Moto X… except without the lovely Google Now Launcher preloaded. That also means Motorola’s thoughtful add-ons like Moto Display and Moto Actions have made the leap to the Turbo, too, so waving your hand over a darkened screen will still give you a sense of who or what is trying to get your attention at any given moment. Always-on voice commands? Those are here too; I trained my Turbo to respond to, “Hey Turbo, you there?” and the system seems just as sensitive and responsive as ever. 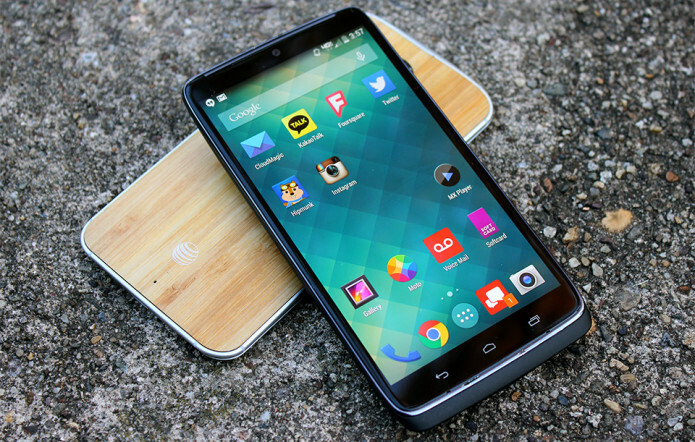 If you read my Moto X review, you’ll know that in addition to helping the Turbo feel almost like an assistant waiting to do my bidding, Moto Voice is also a lifesaver when you occasionally forget where you put the thing. It was even eager enough for my voice that it responded from underneath a pile of gym clothes in my hamper, saving from it from a few rounds in the spin cycle. So what’s actually different here? Uh, not much. The biggest addition to the mix is Motorola’s Droid Zap feature (though iOS and Android users can download it from their respective app stores) — the sorta-neat tool lets you fling photos and videos to people nearby or onto a Chromecast if you’ve got one hooked up. Droid owners can set up distinct regions called Zap Zones to speed up the sharing even more; once activated, you’re basically broadcasting every photo you take to a pre-selected group of people. It’s a neat enough tool (not to mention an easy one to use), but I just haven’t been able to stick with it. After all, you’ve got to coax your buddies to download yet another iOS or Android app to really use the feature, and it’s not like there’s a shortage of ways to share photos anyway. Finally, of course, all of Verizon’s trademark red bloatware is present and accounted for. You can expect to see 16 apps (some useful, some trash) taking up space in your app launcher, but you can at least disable them from the settings menu if you’re itching to tidy up. The Moto X’s lackluster 13-megapixel camera might’ve been one of its biggest failings, and it’s clear that Motorola wasn’t about to let that happen again. That would explain why the Turbo instead packs a 21-megapixel rear shooter with a wide f/2.0 lens, a combination that’s just utterly, staggeringly better than what its poor cousin has to offer. The full-resolution photos I snapped looked crisp and vivid, though not to the point where I’d worry the shots were technically inaccurate somehow. That said, low-light performance wasn’t much to write home about — smartphone cameras have historically been pretty lame when the lights start to dim and it wasn’t long at all before I started noticing grain creeping into my shots. At least Motorola’s HDR mode is surprisingly solid when it comes to eking a little extra depth and verve out of those dim photos. All told, though, the Droid Turbo produced livelier and more detailed shots than the Moto X, and occasionally captured a few shots I preferred over those I took with an iPhone 6 Plus. Front-facing cameras are rarely anything to get fired up over, and the 2-megapixel shooter buried in the Turbo’s forehead doesn’t buck that trend. Your shots will be more than enough to swap on Instagram (or Tinder, if that’s more your speed), but don’t expect anything extravagant. On the plus side, the Turbo fares way better when it comes to video: The 1080p and 4K test footage I captured throughout the week was crisp, attractive and well-exposed, even if switching focus from one subject to another took a little bit of work. All that 4K video you’re bound to start shooting looks great on the Turbo’s hi-res screen, too. 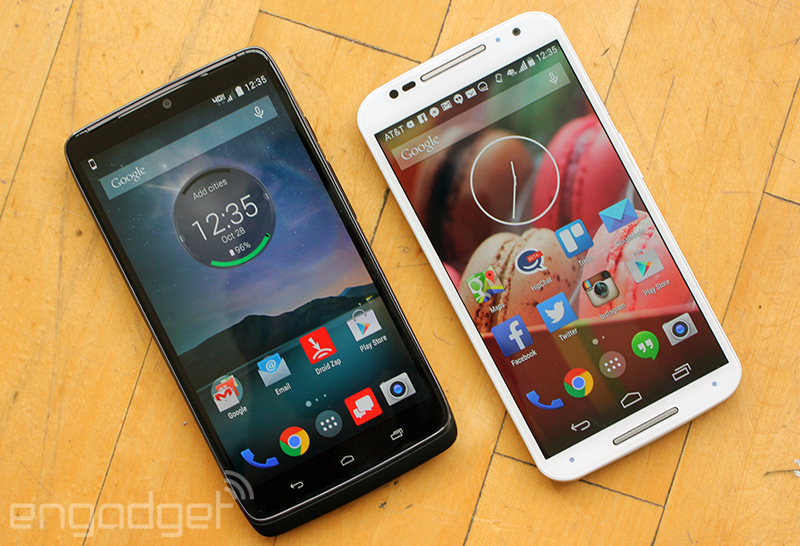 As you’d expect, Motorola’s dead-simple interface is back in full effect, too. Haven’t used it before? No worries: All it takes to snap a shot is a single touch on the screen, which is great for firing off photos in a jiffy. That does mean that the seemingly standard tap-to-focus action isn’t enabled by default, so you’ll probably want to swipe into the settings to handle that (or tweak your flash, HDR and resolution settings for that matter). Trust me: Unlike the Moto X before it, the Droid Turbo can focus on something new in a flash, so getting that extra bit of control to help it understand what to focus on is worth it. And if there’s one potential issue with Motorola’s camera app, it’s that you might not have enough control — still, that’s nothing a quick trip to the Google Play store won’t fix. We’d be looking at one hell of an anticlimax if the Droid Turbo were a laggy piece of junk, but the thing definitely lives up to its name. I mean, of course it would. There’s a 2.7GHz quad-core Snapdragon 805 running the show, paired with 3GB of RAM, an Adreno 420 GPU and a software stack that more or less stays out of the way (I can only imagine how buttery it’d feel running Android 5.0). I spent the past week trying to push this thing to the limit, by cooking up one obnoxious stress test after another, but I ultimately couldn’t detect so much as a hint of lag or visual slowdown while flicking through menus, bouncing between open applications and popping in for a quick zombie smash in Dead Trigger 2… though that last bit does get the Turbo running a little warm. Make no mistake: The Turbo has enough oomph to take on anything else currently on the market, to say nothing of your to-do list. Oh, and in case you were curious, that long speaker grille up front helps make the thing perform well as an actual phone — call quality was crisp and clear, though folks on the other end occasionally thought my voice sounded a little muffled. Unsurprisingly, the Turbo puts up numbers that are either in line with, or a notably better than, the Moto X did earlier this year. It goes round for round with Samsung’s Galaxy Note 4 (which we collectively thought was the best big smartphone you can buy) too, but that’s even less of a shock since they both have the same Qualcomm silicon thrumming away under the hood. Now, about that battery. Motorola likes to say you can squeeze a full 48 hours out of the Turbo on a single charge, and I don’t doubt it. What really matters is the quality of that experience; after all, eking crazy longevity out of your phone doesn’t mean much if you only get to use it as a glorified pocket watch. During my week of testing, the Turbo’s battery routinely stuck with me for two full working days at a time, or about 18 hours of on-and-off phone calls, email replies, tweets, YouTube videos and the occasional Songza jam session. As someone who has to basically coddle his iPhone for most of the day, using the Turbo was a revelation: I could finally stop worrying about how much battery I had left to do something and instead just get it done. In our standard video stress test (say it with me: HD video looping indefinitely with screen brightness set to 50 percent), the Turbo stuck it out for just under 14.5 hours before it finally gave up the ghost. That’s a good four hours more than what the Moto X could achieve, and a just over an hour more than what we got out the Galaxy Note 4 and its significantly smaller battery. And what happens when the Turbo does die? If you’ve got the included (and large) Turbo Charger handy, you can revive the battery and charge it nearly 20 percent in about 15 minutes. Motorola says that’s enough to get you about eight hours of use before it bites the bullet again, a statement that my testing mostly jibes with. It all depends on how you use the phone, of course, but I spent closer to 10 hours using the Turbo as a mobile hotspot and checking the occasional Hangouts message with plenty of standby time in between. The only way you’re going to nab a Droid Turbo is by inking a deal with Verizon Wireless, which narrows your field of competitors by a quite a bit. 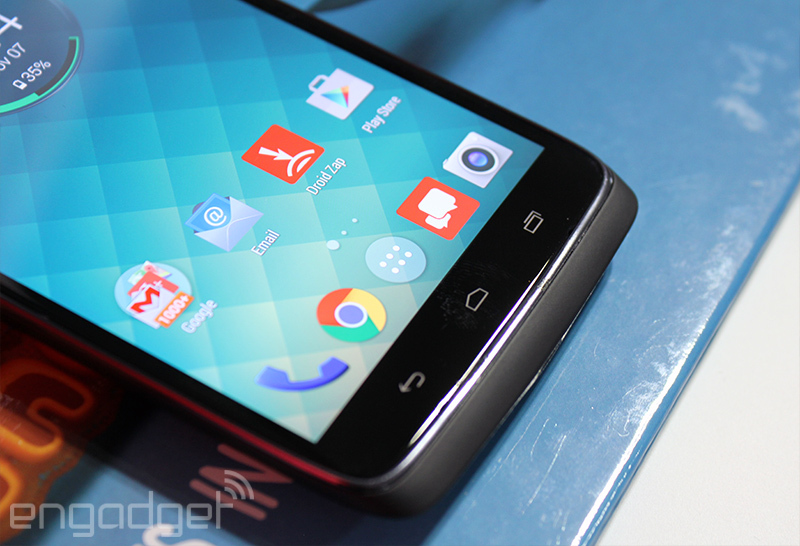 Let’s lead off with the most obvious alternative: the top-rated Moto X. What the thing lacks in battery and camera upgrades, it makes up for in sheer style; for a price, you can customize one to hell and back. Price is probably going to be a big consideration for you too since the base-level, 32GB Droid Turbo will run you $200, or double what the 16GB Moto X does. That gulf shifts a bit if you choose the wooden or leather finish for an extra $25, but we’re still looking at a hefty difference between a great smartphone and its modified successor. Not a fan of the Turbo’s hyper-masculine Droid aesthetic? Or Motorola in general? Fair enough. In that case, consider LG’s G3: It too has a Quad HD screen (even if it’s bigger and a hair less crisp at 5.5 inches), and the company carefully dialed back the high-octane obnoxiousness of its older software efforts. Performance hounds won’t complain too much about the 2.5GHz quad-core Snapdragon 801 chip, even if it’s not quite as powerful as the Turbo for the same price. We were also big fans of Sony’s Xperia Z3v, too — it costs the same as the G3 and the Droid Turbo, and doesn’t have the same brilliant screen as they do, but it’s a powerful (and waterproof) package with a terrific camera to boot. 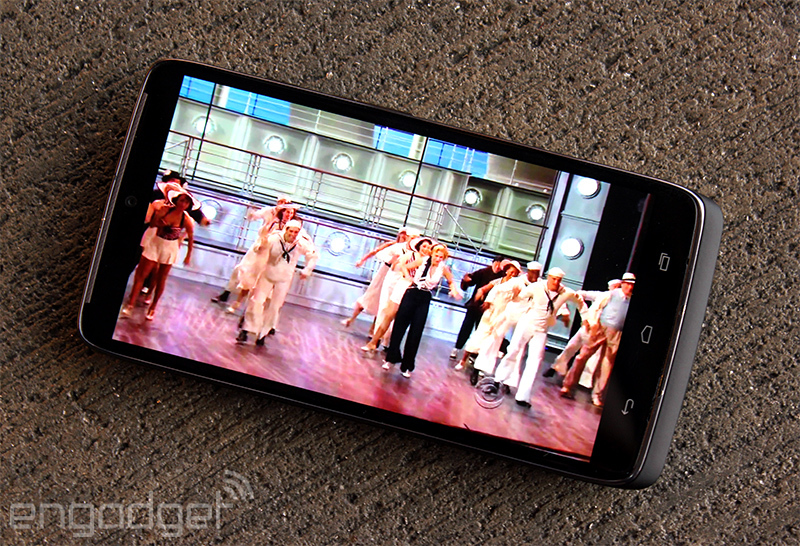 And if you absolutely need an unlocked Droid Turbo, you could try scouting out a Moto Maxx. It’s a nylon-clad, fully unlocked version of the Turbo so it’s fully free of bloatware (and all of Verizon’s garish red), but there’s a rub: It’s only technically available in Brazil and Latin America for now. Bummer? You bet, but I doubt that’ll stop at least some of you from taking the plunge anyway. 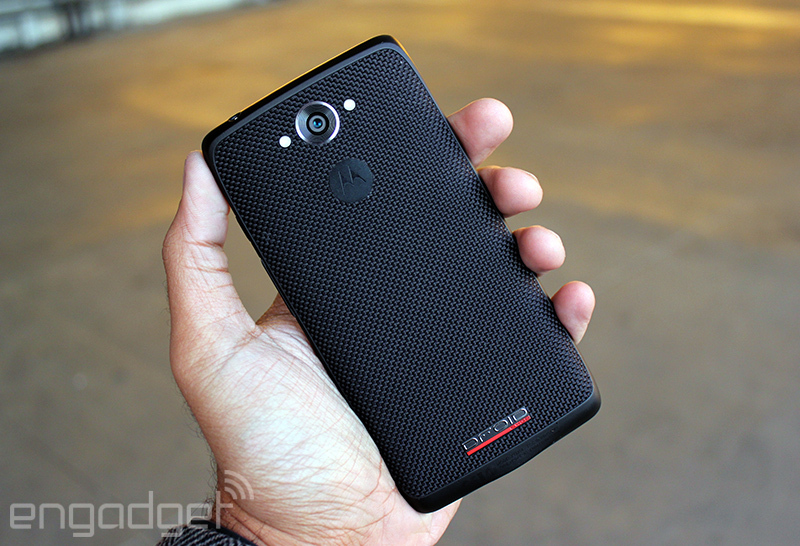 The Droid Turbo is frustrating. It’s objectively better than the Moto X in most of the ways that matter: Its battery is tremendous (if not as amazing as Verizon claims); the screen is lovely; and the camera is actually worth using. 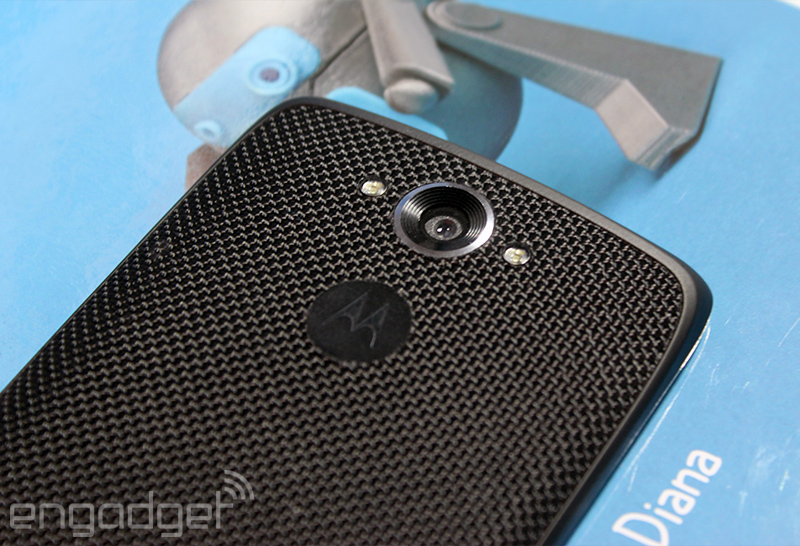 Some might say this is the phone the Moto X should’ve been in the first place, and I can’t argue with that. Still, as ridiculous as it sounds, the Turbo is severely lacking in the charm that made the X so pleasant, and that shouldn’t be discounted. Go to a store. Play with both. You’ll see what I mean. The fact that only Verizon customers can currently buy such a great phone doesn’t help matters either. Here’s what it boils down to: The Droid Turbo is an undeniably great device and probably the best carrier-exclusive phone since the days of, well, the original Motorola Droid. It won’t win any awards for design or sound quality, but that won’t make anyone who already bought a Moto X feel better.